On Friday night, things really get rockin’ in the back of the Charlie O’s with heavy indie-blues rockers Lake Superior. 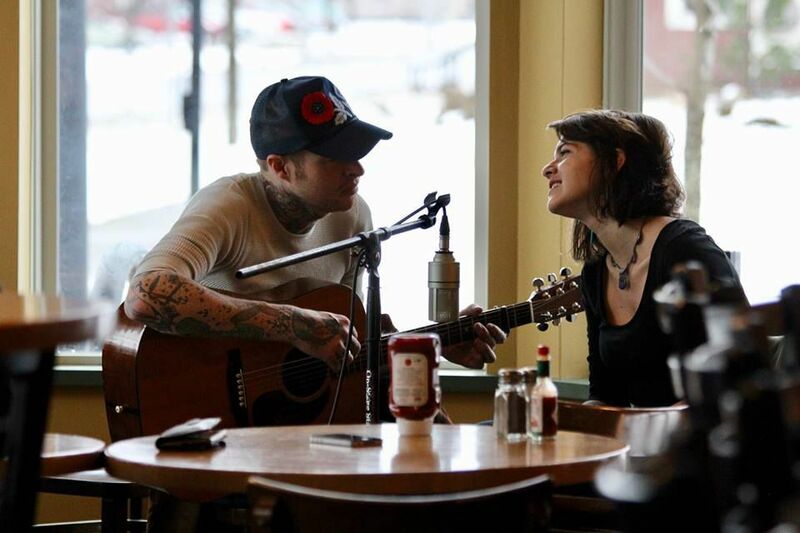 Kelly Ravin and Halle Jade bring their Americana to The Whammy Bar in Maple Corner Friday. Happy Valentine’s Day everyone! I’m quite sure the capital awoke today to see the work of the Valentine’s phantom in the form of thousands of paper hearts plastered throughout the city. Though some see it as litter, I happen to think it’s a charming and unique tradition that is part of what makes Montpelier the special place that it is. Though many are cynical about it, and I myself am no fan of Hallmark holidays, a day dedicated to love and romance is something I can get behind. We can all use a bit more of that in our lives, right? On another note, I went to a big-time show a few nights back at Higher Ground in South Burlington. The Devil Makes Three is one of my favorite live acts. I used to book them a lot back in the day when they were much less known. Now, after over a decade of hard work, they’ve finally started hitting the big time, selling out two nights at Higher Ground, our state’s premier popular-music venue. It was great to see that they still deliver the dynamic, fun, high-energy show they always have. Lots of bands just start mailing it in when they finally reach a certain level of success. Nice to see that DM3 does not fall into that category. Now on to this weekend’s live music options. Valentine’s Day may not be known as a live-music type of holiday, but there are a few options going on tonight for star-crossed lovers and cynical singles alike. Sweet Melissa’s on the corner of Elm and Langdon in the shadow of the golden dome has some holiday-appropriate programming tonight when they host Viva Vermont Burlesque for an evening of vaudeville-style entertainment dubbed “Go Love Yourself.” The fun starts at 8 p.m. for $20 at the door. And speaking of fun, on Friday night, ‘Mel’s is hosting another themed event when house favorite ‘80s tribute act Duroc plays a “Hot Pink Party” starting at 9:30 p.m. Though I personally find the color garish, no doubt this one will be a great time and be very well attended starting at 9:30 p.m.
On Saturday, Mel’s is pulling out all the stops when they present “Frostyfest,” a full day and night of live music benefitting the cause of cystic fibrosis. Featured performers include fem-pop act Yestrogen, Gypsy-swing band Cookie’s Hot Club, and the always fun rock ‘n’ roll outfit known as Guano Loco. The party for a great cause starts at 2 p.m. and goes until closing. If you still haven’t had enough, you can always count on Sunday evenings live band karaoke with The Butcher Blocks starting at 8:30 p.m. Kudos to Sweet M’s for keeping the party going all weekend long. Around the corner at Charlie O’s, they’ve got three nights of programming this weekend as well. You can get things started early tonight with the above mentioned Yestrogen alongside the indie-jazz of Jaguar Stereo. On Friday night, things really get rockin’ in the back of the barroom when heavy indie-blues rockers Lake Superior are joined by Tin Talisman. Lake Superior is an act that gets better every time I see them, and have really been hitting their stride lately — highly recommended. Finally, on Saturday night, the cleverly named Zeus Springsteen is joined by Miku Daza to rock out in the land beyond the pool tables. All three nights start at 9 p.m. A shout-out to O’s new booking manager and bartender extraordinaire Jeffrey, a man with impeccable musical taste who I think will do an excellent job once he gets his legs under him. I look forward to seeing what he’ll have in store in the coming months. Three Penny Taproom on Main Street here in the capital doesn’t often host events, but occasionally they do, and Friday night is one of those occasions. DJ Xavwax will spin vinyl in the wood-paneled dining room starting at 9:30 p.m. Apparently there will be an amazing vinyl collection in the house, so expect great tunes all night long with perhaps a lot of dancing. Hopping over to Waterbury Center, Zen- Barn is hosting live music at its Guptil Road location both Saturday and Sunday nights. On Saturday night, Plainfield-based electro dance band The Electrolads take the Zen stage. Electro is usually not my cup of tea, but what I find most impressive about the ‘lads is the percussion work of Brandon Klarich, which incorporates a wide variety of African and Latin rhythms that really get your feet moving. The fun starts at 10 p.m. for $8 in advance or $10 at the door. On Sunday night, the Zen is taking advantage of the President’s Day holiday on Monday to host a special weekend-ending show with Dark Star Project and special guests. The band does an admirable job of reproducing the music of The Grateful Dead; what better way to celebrate President’s Day than by enjoying the tunes of perhaps the most American band ever? I can’t think of one. Wave that flag for free starting at 9 p.m. Finally, if you make your way up the snowy County Road to Calais on Friday night, you can enjoy an evening of Americana with Kelly Ravin and Halle Jade at The Whammy Bar, nestled cozily in the back of the Maple Corner Store. All weekend music at the Whammy starts at 7:30 p.m. and is for donations. That wraps up this week. Celebrate love, and go see live music.